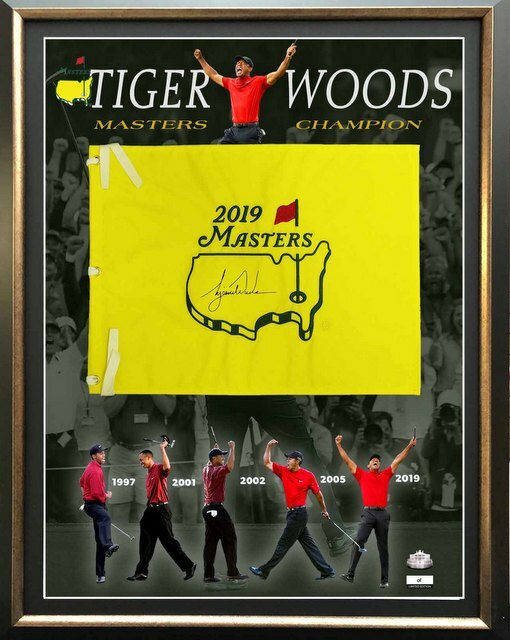 BONUS - BUY THIS PIECE AND RECEIVE A TIGER WOODS SIGNED GOLF BALL IN DISPLAY CUBE VALUED AT $295! This incredible collectable is limited to an edition of just 19. It celebrates not just Tiger's 5th Masters victory but those that went before. Selling fast! Superbly framed and independently certified by the AMA, Australia's premier third party authentication company. Interest-Free Instalment Option: 4 monthly payments of $435.00. The item is shipped after the final payment is made. When Tiger Woods won his first Masters more than half his life ago, he fell into the embrace of his father Earl, because he was barely a grown man himself. When he strode off the 18th green on Sunday afternoon at Augusta National Golf Club - his hair long since thinned, his life long since changed - he walked directly to his 10-year-old son, Charlie, and scooped him up. What a victory. "I don't think I ever saw excitement like that, even when Arnold [Palmer] was at his best," Jack Nicklaus said. "Because they knew what he had gone through and how he had struggled, and everybody likes to see a man make a great comeback." Please allow up to 28 days following the 2019 US Masters for delivery. Image is conceptual only and may be subject to minor amendment.